Limited Edition green 360 Divizion graphics. RAP (Rider Attack Position) construction for a precise fit on the bike. Double layer knee system features durable inner material with heat and abrasion resistant leather outer panels. Quad stretch rear yoke allows the pant to move with the rider. Woven 4-Way stretch front gusset for complete mobility. Active stretch knee panel for unrestricted movement over knee braces or guards. Limited Edition green 360 Divizion graphics. RAP (Rider Attack Position) construction for a precise fit on the bike. Durable 900D Polyester fabric. Double layer knee system features durable inner material with heat and abrasion resistant leather outer panels. Quad stretch rear yoke allows the pant to move with the rider. Woven 4-Way stretch front gusset for complete mobility. Active stretch knee panel for unrestricted movement over knee braces or guards. 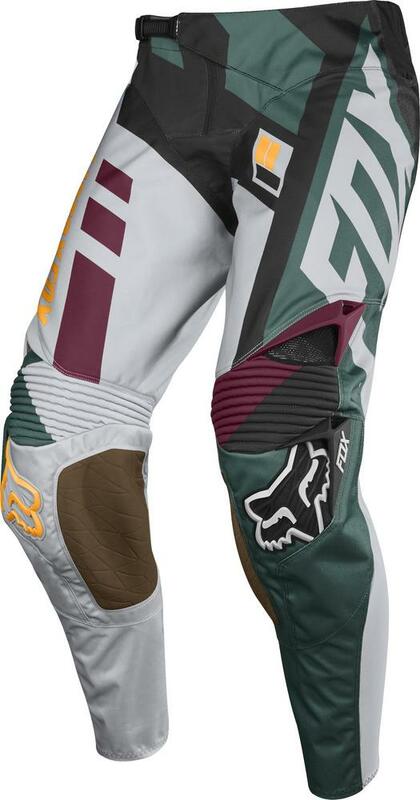 Vented TPR thigh and knee logos enhance airflow. Matching gear set available. Limited Edition.